I never thought I’d make a mug cake, but then I did… and now I am addicted to this Single Lady 5-Minute Gooey Molten Chocolate Mug Cake. Do you remember how on Wednesday I told you guys that I hadn’t been able to cook for the last two days because I had workers finishing up things in the kitchen? Yeah, well that two days turned into three because they didn’t totally finish. Honestly, it’s still not FULLY finished, but all the big stuff is done… in the kitchen anyway. So that meant that I was basically kicked out of the house for the whole day (again), which meant I was back with the family. I could have taken another day to do computer work, because there is always work to be done on the computer, especially since I usually put computer work off until I absolutely HAVE to do it. But I just could not do another day of sitting and staring at my laptop, I had to cook. Two days was a long enough break for me, and as I said, I am not a fan of staring at my computer for long periods of time. Unless of course I am watching some cheesy romantic movie because I am sort of a sucker for those at the moment. SO. All of my stuff is obviously at my house, but I grabbed a few pretty dishes and some parchment paper and I was set for the day. Granted these are not my favorite photos in the world, but they get the point across that mug cakes are DELISH. Or at least I think they do. I mean, don’t you see all the warm chocolate goodness going on? I know that mug cakes are nothing new. I have seen them around for a while now, but this is my first time ever trying them. To be honest, I have never been too excited to make one because I’d rather just make a giant chocolate cake or a ton of cute little molten chocolate cakes, one is just never enough. Seeing as I didn’t have any of my stuff with me, and mom and I needed a warm and ooey gooey dessert, I figured it was time I try the mug cake. 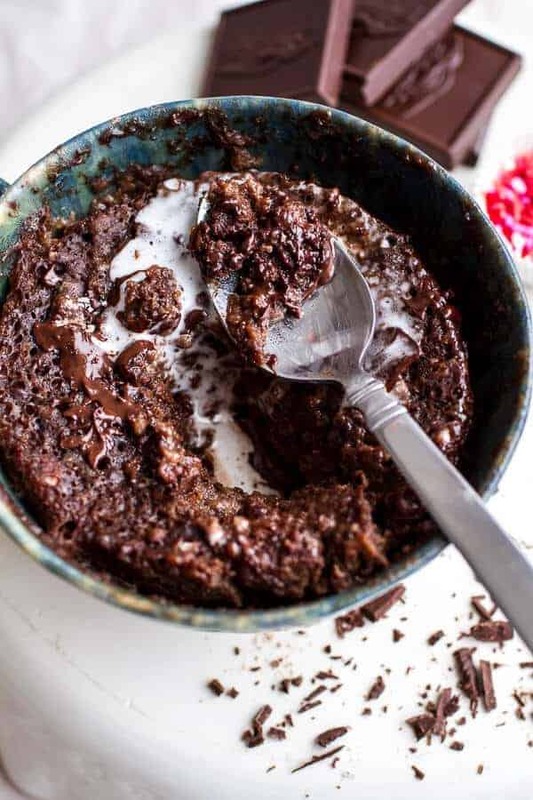 This little 5-minute gooey molten chocolate mug cake is all made in the microwave, which yes, made me VERY skeptical. I try to avoid microwave cooking at all costs because I love my oven (oh, but it totally hates me), but desperate times and a chocolate craving helped me to look past the whole “made in the microwave thing”. Also, just a side note, if you don’t have a microwave, like my Uncle Matt and me (no microwave down at the barn…and I am not missing it too much), you can bake this little cake in an oven safe dish. It works great (probably better than the microwave), but it takes 10-15 minutes. Watch it closely though, since overcooking these is just not a good thing! The best part about this mug cake? It takes literally five whole minutes from start to finish, you use just one dish and one fork and umm, there is that whole portion control thing for all you healthy New Year’s resolutioners out there. The recipe only serves one, making it perfect for us single girls. You could even mix the dry ingredients in a mug and then the wet in another container and pack it all up to take on the go with you. Then just pop the mug with all the ingredients into the microwave for an after-lunch treat at work. 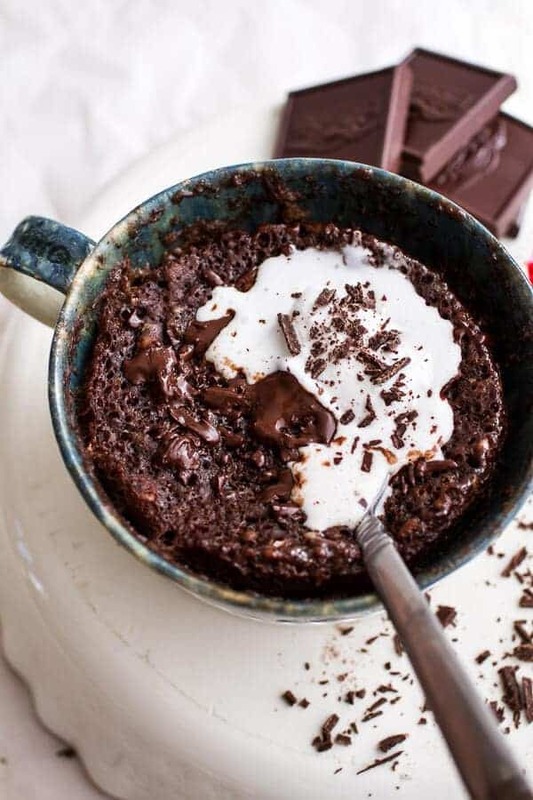 All your coworkers will be SO jealous of your hot and gooey and extra chocolately cake in a mug. The only tricky part about these cakes is finding the perfect cooking time. For me, this meant one minute and 30 seconds in my parents 1200 watt microwave. I wouldn’t go over two minutes though as I am pretty sure that will over cook them. I topped mine with a dollop of coconut whipped cream and chocolate shavings. Toppings for a sweet life, yep – they make everything better! Oh, and since it is Friday? That means these are totally acceptable. Especially because of all of our healthy eating that we did this week. 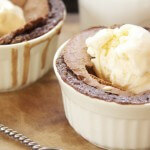 5-Minute Gooey Molten Chocolate Mug Cake. I never thought I'd make a mug cake, but then I did... and now I am addicted to this Single Lady 5-Minute Gooey Molten Chocolate Mug Cake. Lightly grease a microwave safe mug with cooking spray. To the mug add the flour, cocoa powder, coconut sugar and a pinch of salt. Whisk it all together with a fork. Add the egg, coconut milk, coconut oil and vanilla. 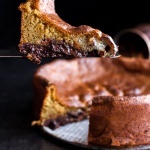 Use a fork to whisk the batter together until just combined. Try to make sure you have incorporated all the flour off the bottom of the mug. 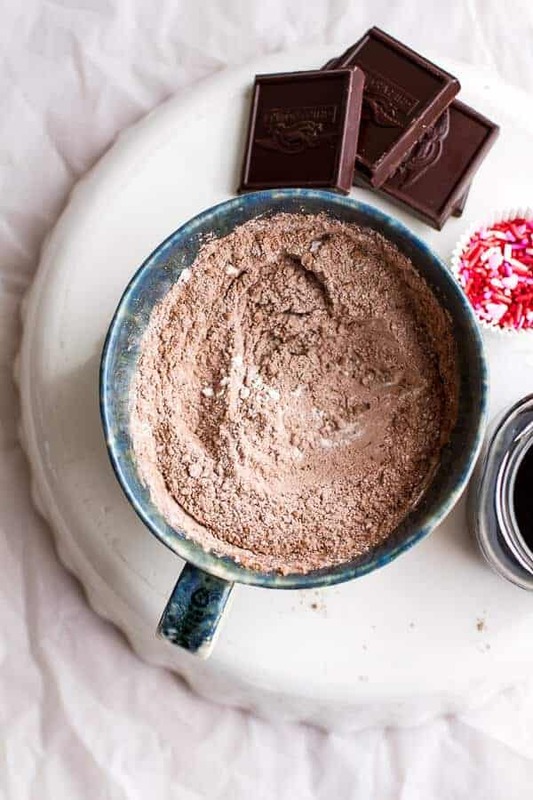 Lightly break up the chocolate and place it in the center of the mug. Drizzle the coffee overtop the batter. Place in the microwave and microwave on full power for 1 minute and 30 seconds to 2 minutes. I have a 1200 watt microwave and found 1 minute and 30 seconds was perfect. Allow the cake to cool 1 minute and then dollop with coconut whipped cream and chocolate shavings. Enjoy right away, warm! Oh, and grab a cold glass of milk too! *Every microwave is very different, so it may take a couple of tries for you to get the cooking time just right. **Just a heads up. If you are making the coconut milk whipped cream you need to refrigerate the coconut milk over night. Coconut Whipped Cream 1 (15 ounce) can full-fat coconut milk, cold 1 tablespoon powdered sugar 1 teaspoon vanillaTo make the coconut milk whipped cream. Flip your cold can of coconut milk upside down and open it. There should be around 1/2 cup of coconut water at the top. Pour this into a container and save for another use. Scoop out the coconut cream and place in a bowl. Whip the cream for 3 to 5 minutes, until soft peaks form. Beat in the powdered sugar and vanilla. Place in the fridge while you make the syrup and fritters. I love these little cup/cakes in a mug. I also like to make the egg for breakfast in one because it is quick and I can throw all kinds of things in with the egg. But for now I will stick with oatmeal on these cold mornings. But the mug cake would be a great after school treat. 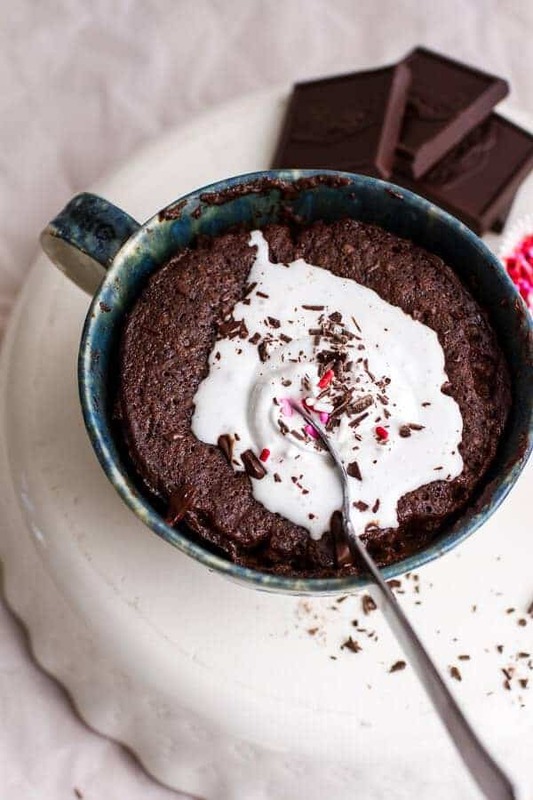 I am sucker for chocolate mug cakes and with coconut whipped cream looks pretty killer! I’ve never tried a mug cake but yours looks so good I may need to change that. I’m with you on microwaves it’s the one appliance I could do without forever. I even prefer reheating things in the oven they just taste better. I’ve never made one either but I might just make one today. Low time investment plus I have a few ideas for add-ons so why not experiment! Gorgeous treats for a couple as well! I have never made a mugcake before, but being a single lady as well I might have to give it a try once! Sometimes you just don’t want to bake a cake that serves many people, but just one for yourself, so this will be perfect! Yup, mug cakes are the bomb. And this recipe must literally be a bomb because I can just tell how dangerous it is! That center. Ugh, excuse me while I go make one. Or two. Hubba hubba! Now that is my kind of mug cake! I totally feel ya on the microwave-skepticism, but something they just WORK. I am all over this 5 minutes worth of chocolate heaven. Pinned! 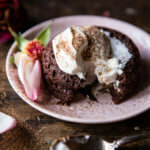 I’ve never been able to make molten lava cakes the traditional way – definitely going to be giving this microwave version a try! My goodness, that does look amazing. And, so easy. I’m going to have to share this with my son. 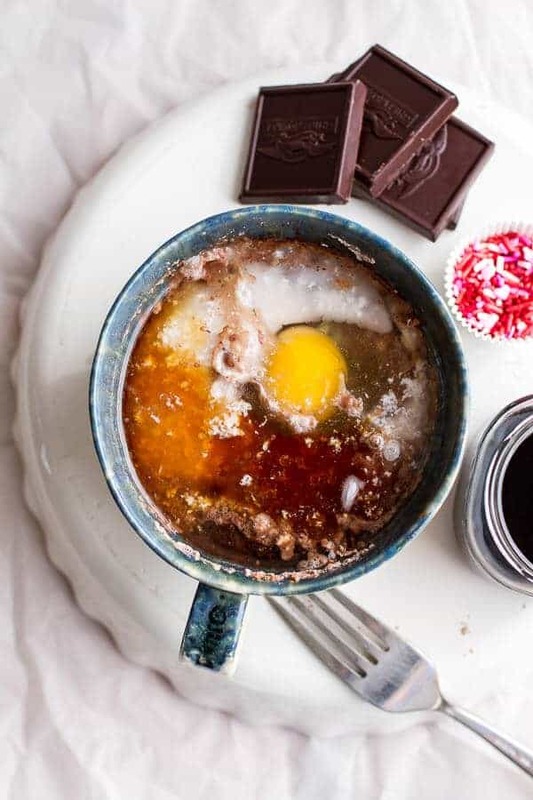 He makes chocolate mug cakes at least once a week, but I think this recipe is one he will love much better. Thanks for the recipe. These photos are absolutely stunning! I know all about not having a kitchen. 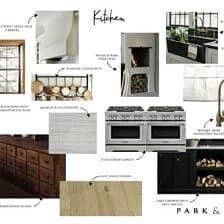 It was so hard living without my kitchen for 4 months while I was having it renovated. 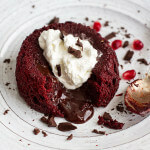 This mug cake sounds and looks absolutely delicious. Pinned. Great idea! I never thought about making one at work, but that is so smart! I totally agree with your stance on mug cakes…why not just make a big one! But then there are times when you just need something quick that’ll fill that craving. Love this, and your pictures are beautiful! I cannot pin this on Pinterest. Are you not associated with Pinterest any more? This is exactly what my Friday needs, T! 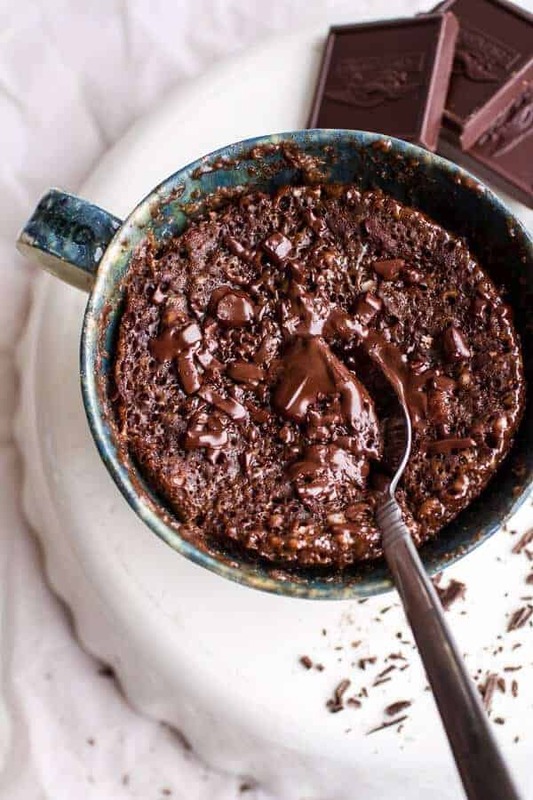 All the gooey chocolate… in 5 minutes?! YES. Have a great weekend! Argh! Never mind! I see it! User error on this one! Haha! Mmk I know you said these photos aren’t your favorite, but honestly I love them! And I’ve never tried a mug-cake (mostly because of all of the Pinterest fails I’ve heard about). But obviously I have been missing out! This looks so decadent! That’s great idea! Just in time for the weekend! ohhh Tieghan. We literally just got rid of our microwave, I wonder if I could bake it, not so quick but I really want to make it! 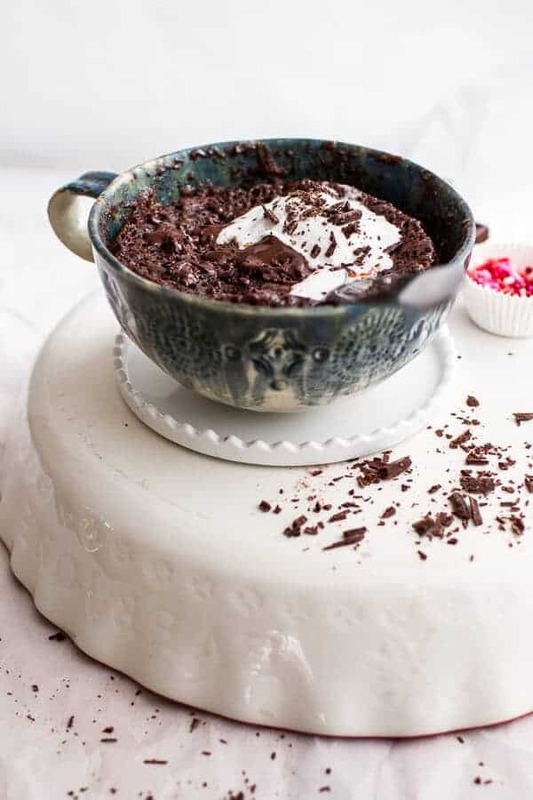 I was skeptical of mug cakes until I tried one that was delicious! 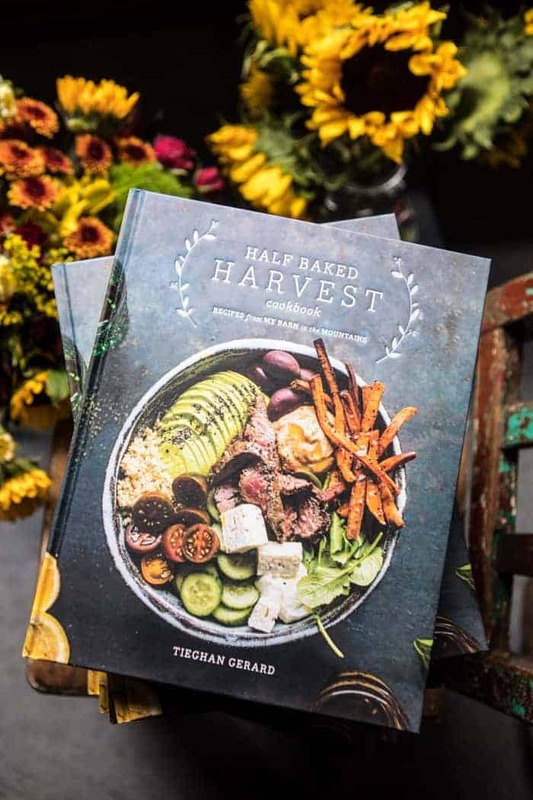 This looks like it could definitely be part of that club…Your photos make me want one right now, so I think you achieved your goal…even if you had to run out with just a few pretty dishes and a piece of parchment…love the mug! Well this is just adorable! 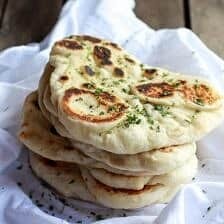 So quick and simple and it looks so delicious. Hope everything keeps moving along and that you can get back to your own kitchen soon! 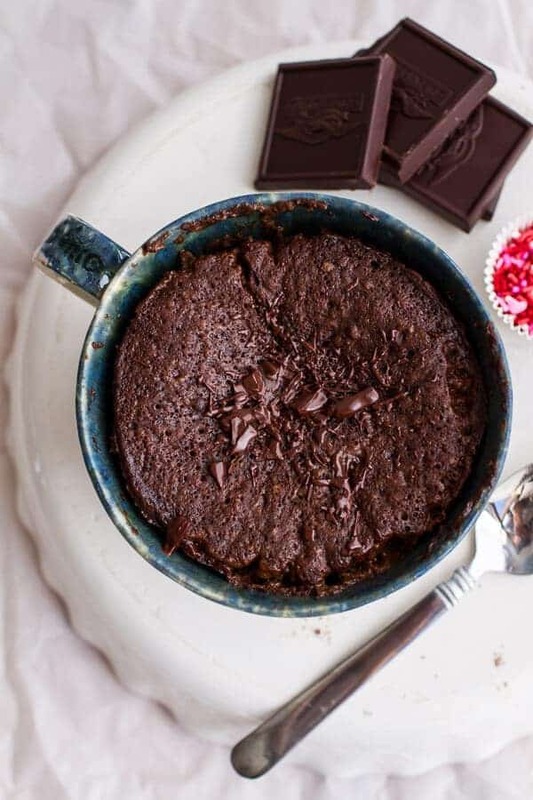 LOOOOOVE this single serve cake- it ain’t just for single ladies! Looks amazing! Also so glad the website loads more quickly! I stopped leaving comments because it took so long! Yum! I love this. Lovely new site design too! I’ve been craving chocolate all week and this is going to be the perfect ending to my night! So much better than buying the frozen kind. P.S You changed your site! 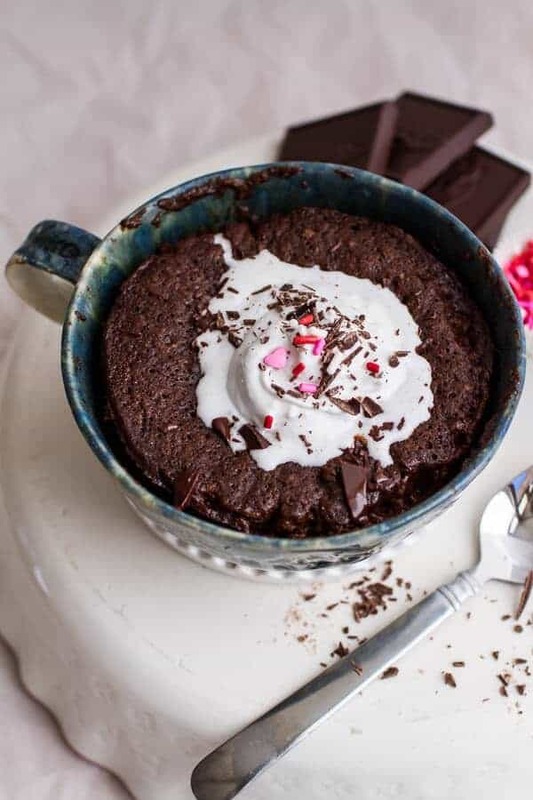 TGIF, I totally need this mug cake in my life for some chocolate goodness! The pictures still look great and definitely get across how delicious it is!! 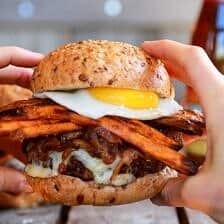 I really want to make this, but stupid question: why the difference in sugar measurements (2-4 Tbsp. ), and how much do you use? Girl these are some gorgeous photos you took!! I am not a fan of cooking in microwave too but recently I found myself in the same situation and tried this ever popular mug cake!! Yours look so pretty! I have seen mug cakes all over also and have yet to try them. But, I trust your expert foodie opinion, so this single lady is going to give it a try! 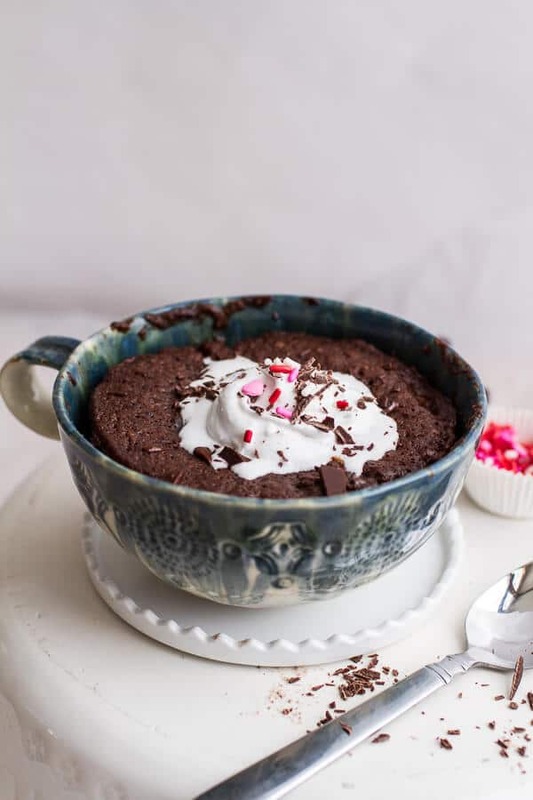 Totally with ya on the microwave thing and one cake just not being enough but your mug cake looks so good that I might just have to make one while I watch some cheesy romantic movies this weekend! Your dishes. Your photos. Your recipes. O. My. God. To. Die. For. 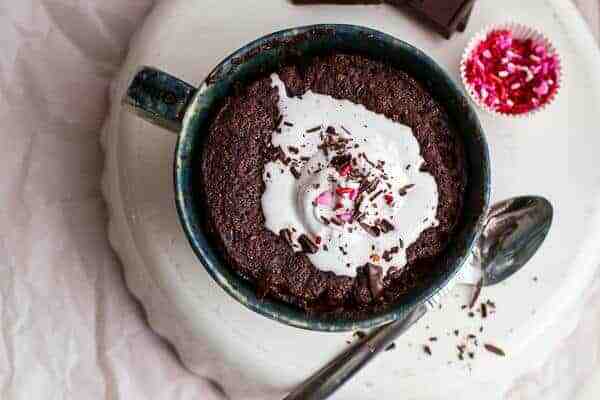 I’ve never been a huge fan of mug cakes either but this is one that I can definitely say I need to make asap! Agreed, one will not be enough so I’m thinking multiple mug cakes haha. Wow, this is the most decadent cake in a mug I’ve ever seen! The molten center is such a great idea! And you’re right, it’s perfect for a Friday night! Tieghan, this is killer! Love this idea, because sometimes, all you need is chocolate. Pinned! Oh man, I’m scrolling through thinking “these photos are gorgeous!” and here you are thinking they aren’t your favorite. They are absolutely stunning and I’m thinking about making myself a mug cake for dessert tonight now! I LOVE your mug too! Haha! Thank you so much, Sarah! I saw something with a very similar name in the Joy the Baker cookbook! Thanks so much, Lauren!! I do not have that cookbook, but I bet her recipe is awesome!! Do you have a recommendation for substituting the coconut oil? I have an allergy to coconut. Otherwise, this little recipe would be lovely for when I get a cake craving. I have almost all of those ingredients on hand all the time. Hi! I would just use canola oil, that will work great! My cake came out awful, it was like a bad bread pudding. I also have a 1200 watt and followed the recipe to a “T” ! I was so looking forward to this, (still a great recipe), just an unknown error by me 🙁 ! Thanks for the fun experience though! I like this recipe. I too am not a mugcake person, per se, but last night I was between dragging myself to the grocery store (drag is an exageration – I live directly across the street from a huge supermarket) for the pint of Ben & Jerry’s I’ve been craving for months, or stay home in my pajamas and make a mugcake to soothe my sugar pangs. I went on a very well known blogger’s site looking for recipes and her “5-minute” recipe was literally a full blown cake just scaled down into one portion. So it had a list of at least 15 ingredients. I’m sorry, but I can’t locate AND measure, AND mix, AND bake with 15 ingredients in 5 minutes. Especially since there’s a step of dicing apples involved. I’m lucky if I can even gather all the ingredients within 5 minutes. AND if I’m going to go through all that work with 21947 ingredients, I might as well just make the full blown cake, cut it into portions, and freeze for later. Thank you for keeping it on the simple side. SO HAPPY my recipe was able to please you! 15 ingredients for a mug cake? That sounds like a lot! Thanks Melissa! Hope you have a great weekend! I have a chocolate chip cookie in a mug recipe that I just love, so I will definitely try this one. 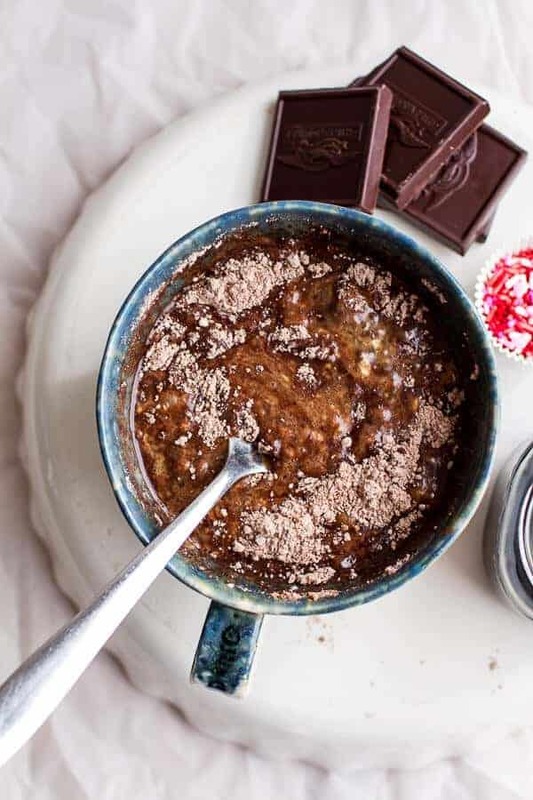 I agree with avoiding microwave cooking but these little mug recipes are so nice in a pinch when you just want something chocolate but don’t want a whole cake or have time to make one. And your photos are gorgeous as always! I just made this for myself and my mother! We both enjoyed it garnished with some mint chocolate chip ice cream! Very moist! Does great in a pinch or a craving! I made this recipe, followed all yhe instructions but like Sabrina posted, mine turned out not good. It was like a bread pudding, consistency was off and i was surely disappointed. I made no changes to the recipe, used great quality ingredients, so i dont know what happened. Any suggestions? You think one minute would be too little? I think this is probably because of your microwave, they are all different. I would try a minute, and then just go longer if needed. Sorry you are having trouble! Hey Donna! Honestly, I really do not know. I have never used is Cacaco powder. Let me know if you try it! what if I dont have coconut oil, what can I substitute for it? Butter or canola oil will work, enjoy! So excited to try this out! I do have a question though: you mention that baking this in the oven instead of the microwave would take about 10-15 minutes–at what temperature should I bake the cake? I’m a baker but I must admit, this is the best dessert I’ve ever made!!! We love to use Andie’s mint chips in the center over mint chocolate chip ice cream. My family loves this recipe. Who knew a delicious creation could come from a microwave…everyone must try this!!!! try add in a scoop of nutella to the center before cooking OR you could also use chopped chocolate too. Hope that helps and I hope you love this! This was amazing! Try using Chipotle chocolate for an extra kick! Um, whoa! I bet that is awesome! Thanks! The pictures looked promising, so had to try it. It came out rubbery, wastage of time and ingredients. I am sorry it did not work out for you. How long did you end up cooking it? Cooked it for 1 minute 25 seconds. Hmm, I am wondering if that was too long. You microwave might be stronger, which would have made the cake rubbery. It made a HUGE cake, I shared with my partner and the left overs are in the fridge for tomorow! I also had to modify your recipe as is isn’t have all the ingredients. I only had 1tbs brown sugar but it was still perfectly sweet. I used rice bran oil as it was more convenient, and normal light cow’s milk. And I just sprinkled instant coffee granules on top and poured on some hot water. And had just 1tbs milk choc chips. Hi, this looks really yummy and I really want to try it but I was wondering if it was possible to sub the coffee with something else? 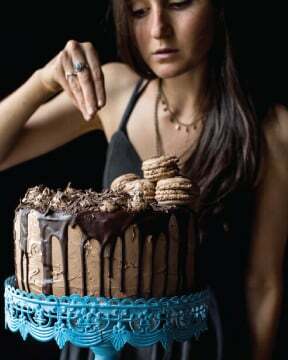 I just tried this cake which looked so decadent for my busy weekday. 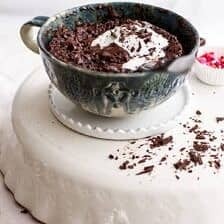 i was craving dessert and this quick microwave cake looked great! However, I have to say, i was quite disappointed. I did everything according to the recipe but the cake turned out to be a jell-o like consistency; gooey and bland. I didn’t do anything different except substitute the coconut milk for regular milk and the coconut oil for butter. My microwave was 1250 watt so I warmed it for a minute and 20 seconds rather that 2 minutes. I don’t think i did anything incorrectly but it was really sad to have to throw away food (dessert especially)! Please let me know if I was doing anything incorrectly. HI! I am SO sorry for the trouble! I have found that a lot of people microwaves are very different and can produce extremely differently results. That said, this is supposed to be a very goey cake, so maybe it was just a little gooier than you where thinking. Please let me know if you have any questions or how I might be able to help. Thank you! This was very good. I didn’t put the coffee on top but did put whipped cream. Really hit the spot, kinda full now:). I will try cutting the recipe in half next time! Thanks for sharing! If you dont’ like coffee you can omit it. Let me know if you have other questions. Hope you love this! If you don’t like coffee you can omit it. 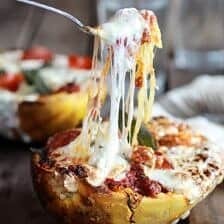 The recipe is amazing BUT why doesn’t it shock anyone that there’s so many recipes on this site named “single lady” ?!! You don’t need to be single nor a lady to appreciate a solo treat. Yes, this is “just” a recipe and probably not willing to harm but it’s all the small things we see/hear/read daily that encourages men vs women stereotypes. We all -including me- need to be aware of our sayings’s influence. Hi Johanna! Thank you so much for your comment. What I mean by single lady in this caption is that the recipe only makes one serving, making it perfect for one person. I did not mean to offend anyone in anyway and I apologize. I hope you can see past this misunderstanding and enjoy some of the recipes on my blog! Hi Tani! I am so sorry to hear that! Is there anything I can help you with so it turns out better next time! Please let me know! I’m sorry, but I wasted 2 eggs on this “recipe”. Both times I ended up with a mug of rubber that was barely reminiscent of chocolate. There are real and better versions if whatever this is, out there. Hi Patty! I am so sorry to hear that. Is there any questions I could help you with? I hope you try some other recipes on my blog!